Hotel collection is between 7.00 and 7.20 am. Boarding time is at 7.45 am. Departure time is at 8.15 am. The cruise will return to Athens at approximately 7.00 pm. This cruise is available all year. May to September is the best time to visit if you plan to swim or sunbathe. 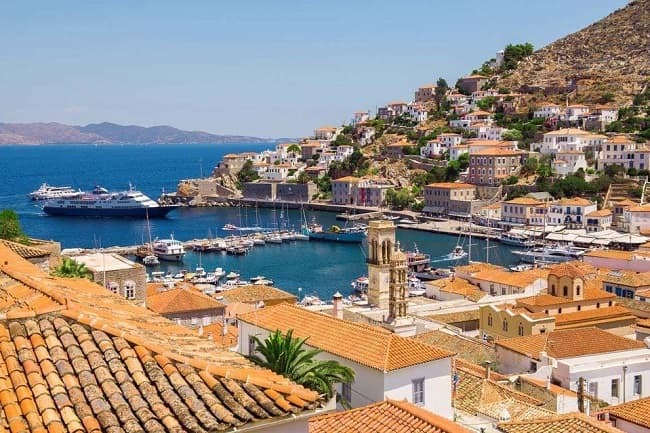 We are comparing Hydra, Poros, And Aegina Full-Day Cruise With Lunch Prices from leading ticket suppliers and Try to find you Cheap tickets prices on the market. This is a full-day extravaganza aboard a glorious 50 metre cruising vessel. Designed for your comfort and enjoyment the ship will be fully equipped with an onboard bar, dining area, comfortable seating and Wi-Fi. So climb aboard and you’ll get the chance to start exploring the wonderful Saronic Golf. During the cruise you’ll get to drift between the 3 main islands of the golf, with time to sightsee, shop, eat, or hot the beach in each location. Your will have approximately 90 minutes to visit this island. Hydra is famous for it’s well preserved old town, made up of cobblestone streets and churches dating back centuries. This is the second stop and you will have approximately 50 minutes to visit. You’ll find a collection of local bars and restaurants serving typical Mediterranean foods. The island is thick with beautiful pine forests but also home to an archaeological museum and historic clock tower. Home of the Temple of Athens which completes the famous ‘holy triangle’. You’ll also find a church dedicated to the patron saint of the island, St Nectarios. If you’ve ever dreamed of sailing between beautiful Greek Islands with the wind in your hair then this full-day tour should fulfil that dram. The cruise is suitable for people who want to visit the islands on a budget. Family friendly and suitable for small groups. If you suffer from seasickness then the cruise may not be for you. Your Experience With Hydra, Poros, And Aegina Full-Day Cruise With Lunch? Enjoy the refreshing sea breeze whilst cruising on the Saronic Golf. Visit the regions 3 most popular islands. Take advantage of free time to explore each island however you choose. Have the option to join guided tours of the islands. (additional cost). Tuck into a delicious Greek style buffet lunch. Watch traditional Greek dancing performed onboard your cruise ship. See beautiful sights and the Greek coastline from the water. What Hydra, Poros, And Aegina Full-Day Cruise With Lunch Includes? Full-day boat cruise visiting Hydra, Poros, and Aegina. Onboard buffet lunch with water. Onboard English and Spanish speaking guide/host. If VIP Option is selected in the booking: private lounge, welcome drink, meeting with the ships captain, complementary tour and onboard snacks (VIP Only). If you are planning to take this tour in a group or with your family then you might prefer to book the VIP option and benefit from the use of a private lounge. Travelers Reviews about Hydra, Poros, And Aegina Full-Day Cruise With Lunch? There are some very positive reviews for the Hydra, Poros, and Athena full-day cruise. Many people who have taken the tour agree that it is a fantastic way to see the 3 islands and also the cheapest way. Comments generally say that the cruise is good value for money although reviews do point out that there are additional charges if you want to take tours on the islands. Most customers agree that there is a good balance of sailing time and island time. The 3-island cruise from Athens has a 4.4-star average score on Get Your Guide. On both TripAdvisor and Viator the cruise has a strong 4.5-star score. Not practical for wheelchair users. You should receive instant confirmation of your booking. Tickets are accepted in mobile form or printed form. Tickets are refundable but policies vary depending on your tour supplier. Cancellations should be made in advance in order to avoid any cancellation charges. Apart from lunch no food or drinks are included in the ticket price. Alcoholic beverages, soft drinks and snacks are available for purchase from the onboard bar. There are optional tours available on each island (additional charge). Hotel pick-up is only available from certain centrally located hotels and not from private apartments. Collection for your hotel if it is located in Central Athens (Check with your tour provider). Optional collection from cruise ship terminals, Rafina, or Lavrio (additional charge).